Trust and open communication are integral pieces of the doctor-patient relationship, paramount to a successful surgical outcome and a positive patient experience. However, meeting patient information needs and engaging them from diagnosis to recovery has been an ongoing challenge. This challenge has been emphasized during the last two decades thanks to the implementation of the Enhanced Recovery After Surgery® (ERAS) protocol . While ERAS® has presented a consensus for optimal perioperative care, health organizations still struggle to embed its recommendations within their operational workflows. In this series, we will present how pre and post-operative communication and engagement can be optimized and implemented based on the ERAS® protocols. A major issue with significant adverse effects is surgery cancellation due to patient no-show and miscommunicated changes in the patient’s medical status. Cancellations of planned surgical procedures have been a long-standing problem, causing a significant loss of revenue and wasted resources for care providers . Studies have shown surgery cancellation rates as high as 23% with more than half of these cancellations easily avoided by optimizing the preoperative patient engagement. Earlier clinical assessment of patients, better planning and documentation systems, and increased involvement of patients in the scheduling of surgeries have all proven to help reduce these rates . The preoperative area is a critical dimension of care transition. One of the main goals of the preoperative assessment is to determine the factors that can pose risk for intraoperative and postoperative complications. Overall, the perioperative complication rate has declined over the last decades, but surgical complications are still common and often preventable . Communication breakdown between the healthcare team and the patient and the consequent loss of information poses great threats in patient safety. On the contrary, previous research on the subject has shown correlations between effective communication and objective medical outcomes such as blood pressure, blood glucose, and functional status . The preoperative period is the right time to educate patients about the various stages, procedures, and results of surgery. When directions from the clinical team are only made available at the stage of discharge, patients run an increased risk of forgetting or misunderstanding them, which can lead to recovery issues and readmissions . Poor health team-patient communication or lack of patient engagement before surgery can also lead to non-adherence to medical regimens post-operatively. Research on the topic has shown that keeping patients well informed and optimizing their expectations pre-surgery helps to improve outcomes up to 6 months after treatment . Applying clinical pathways to the perioperative care has been a common practice among surgical teams; however, Enhanced Recovery After Surgery® (ERAS) is the next step to be taken in person-centered care. Pioneered by Henrik Kehlet in the 1990s as an effort to improve recovery after colorectal surgery, ERAS® is a multidisciplinary and multimodal evidence-based improvement process to maximize patient recovery. The key elements of ERAS® protocols include preoperative counseling, optimization of nutrition, standardized analgesic and anesthetic regimens and early mobilization . Implementation of ERAS® programs has produced significant clinical and economic benefits in a range of surgical subspecialties. Studies have shown that ERAS® protocols have resulted in shorter length of hospital stay by 30% to 50% and similar reductions in surgical stress response and complications, with readmissions and costs also reduced  . Despite the significant body of evidence highlighting their link to improved outcomes, ERAS® protocols are not straightforward to implement. Given its varied nature, implementing this evidence-based perioperative care into surgery practice is challenging. According to ERAS® Society, there are ∼20 components of care that influence the enhanced recovery, which means that designing and implementing an ERAS® protocol is a multidisciplinary endeavor . The health teams responsible to implement ERAS® are charged with reviewing the available literature and formulate and deliver the protocol pathway. In doing so, teams need to overcome the barriers a multimodal recovery pathway entails, while also communicate frequently and clearly with the patient. Having a standardized process as a basis to implement these protocols and timely communicate with patients is, therefore, paramount. In implementing ERAS® protocols, various healthcare organizations have produced their own checklists of clinical guidelines and practical recommendations. However, with the number of surgeries rising and the pressures of care consumerization, medical organizations now need a scalable mechanism for embedding these protocols into operational care pathways. 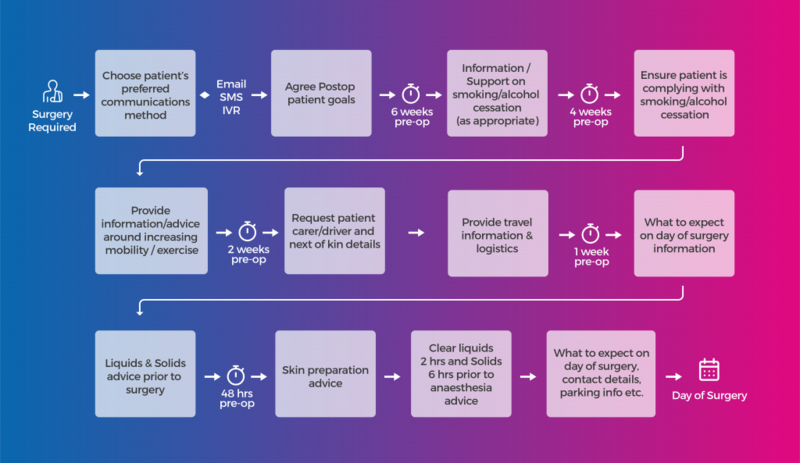 Identifying this need and focusing on improving the patient experience across the surgical continuum, we have structured a pathway that fully operationalizes ERAS® implementation into workflow, without the need for checklists. Based on colorectal surgery, in line with ERAS®’ primary focus, this can be applied across any surgical area ensuring optimal patient engagement. ERAS® protocols can be translated into pathways run by a Care Pathway Management platform (CPM). Using CPM allows healthcare organizations to tailor and customize their patient’s communication delivery to engage with them as necessary in the preoperative phase. In a typical, elective surgery example the communication can begin as early as 6 weeks prior to the day of surgery. The Care Pathway Manager can reach out to the patient at predetermined intervals and provide them with the right information and the right time. ERAS® states that patients should routinely receive dedicated preoperative counseling in order to diminish fear and anxiety and enhance postoperative recovery. In addition, increasing exercise preoperatively may be of benefit, while smoking along with alcohol consumption should be stopped 4 weeks prior to surgery. There are additionally fasting guidelines and information on the consumption of carbohydrate drinks 2 hours prior to surgery. By engaging the patient early on in the process; using their preferred communication method, pertinent, time-relevant information is drip fed to them, ensuring the patient is not overwhelmed by the amount of information that is provided. Using Care Pathway Management technology teams can ensure, not only that the information is provided to the patient, but also that the information has been read. Optimizing the preoperative patient engagement is paramount for both patients and healthcare providers. ERAS® is a multidisciplinary approach to the care of the surgical patient in the form of protocols, the implementation of which has proven to result in major improvements in clinical outcomes, patient experience, and costs. Adherence to these multimodal, evidenced-based pathways in the perioperative period is fundamental. To enable patients to do so, providers need to optimize patient engagement and communication. Now more than ever, health organizations need to move on from the current ERAS®-based checklists of practical recommendations to an operationally integrated pathway enabling them to streamline their preoperative processes and deliver real-time information to patients. Interested in finding out more about care pathway management for Surgery? Kehlet, H., 1997. Multimodal approach to control postoperative pathophysiology and rehabilitation. British Journal Anaesthesia 78 (5), 606e617. Dimitriadis, PA. Iyer, S. Evgeniou, E. The challenge of cancellations on the day of surgery, Int J Surg. 2013;11(10):1126-30. doi: 10.1016/j.ijsu.2013.09.002. Epub 2013 Sep 12. Haynes AB, Weiser TG, Berry WR, et al. The Safe Surgery Saves Lives Study Group A surgical safety checklist to reduce morbidity and mortality in a global population. N Engl J Med. 2009;360(5):491–499. Morales, C. Lemes Pozza, Alexandre, Jenefer Garcez, Prim, Suzana, & Amante, Lúcia Nazareth. (2014). Perioperative communication from the perspective of patients undergoing bariatric surgery. Texto & Contexto – Enfermagem, 23(2), 347-355.